Pharr is a city in Hidalgo County, Texas, United States. As of the 2010 census, the city population was 70,400, and in 2016 the estimated population was 77,320. Pharr is connected by bridge to the Mexican city of Reynosa, Tamaulipas. Pharr is part of the McAllen–Edinburg–Mission and Reynosa–McAllen metropolitan areas. Mayor Dr Ambrosio "Amos" Hernandez. Pharr is located in southern Hidalgo County at 26°12′23″N 98°11′7″W﻿ / ﻿26.20639°N 98.18528°W﻿ / 26.20639; -98.18528 (26.206334, -98.185174). It is bordered to the west by the city of McAllen, to the north by Edinburg, the county seat, to the east by San Juan, and to the southwest by Hidalgo. The Pharr city limits extend south in a narrow band to the Rio Grande and the Pharr–Reynosa International Bridge into Mexico. According to the United States Census Bureau, Pharr has a total area of 23.4 square miles (60.7 km2), of which 0.03 square miles (0.07 km2), or 0.12%, are water. The community was named after sugar planter Henry Newton Pharr. In 1900 Henry N. Pharr for a number of years was a director of the State National Bank of New Iberia, Louisiana, and was a former president of the Louisiana - Rio Grande Sugar Company and the Louisiana - Rio Grande Canal Company, which at one time owned 8,000 acres (32.4 km2) and which, in 1910, built the town of Pharr on this land. Pharr has grown rapidly since the late 20th century, from a population of 32,921 in 1990 to an estimated 77,320 in 2016. Pharr has a humid subtropical climate, similar to that of the Tampa Bay Area of Florida but with less precipitation and slightly higher summer maximum temperatures. The average high in January is 68 °F (20 °C), and the average low is 47 °F (8 °C). In August the average high is 100 °F (38 °C), and the average low is 80 °F (27 °C). The warm season is long, with average highs and lows similar to August's from June through September. The average annual precipitation is 21.0 inches (530 mm). Most precipitation occurs in the warm season, with the least precipitation distinctly occurring in the cooler winter. As September is the peak of the north Atlantic hurricane season and tropical storms and hurricanes occasionally drop copious amounts of rainfall on the region, this month tends to be by far the wettest, averaging 3.6 inches (91 mm) of precipitation. The driest month is March, with 0.7 inches (18 mm) of precipitation. Despite frequent temperatures above 100 °F (38 °C), occasionally as early as February and as late as the end of October, the highest temperature ever recorded in Pharr is 110 °F (43 °C), once in 1998 and once in 1999. The lowest temperature ever recorded in Pharr is 13 °F (−11 °C), on January 12, 1962, which is far lower than would be expected at the same latitude in Florida or on the west coast of North America, due to Pharr's location closer to the middle of the continent. As of the census of 2000, there are 46,660 people, 12,798 households, and 10,878 families residing in the city. The population density is 2,240.2 people per square mile (864.9/km²). There are 16,537 housing units at an average density of 794.0 per square mile (306.5/km²). The racial makeup of the city is 79.46% White, 0.24% African American, 0.72% Native American, 0.23% Asian, 0.03% Pacific Islander, 17.29% from other races, and 2.04% from two or more races. 90.62% of the population are Hispanic or Latino of any race. There are 12,798 households out of which 47.1% have children under the age of 18 living with them, 64.2% are married couples living together, 16.9% have a female householder with no husband present, and 15.0% are non-families. 13.3% of all households are made up of individuals and 7.6% have someone living alone who is 65 years of age or older. The average household size is 3.64 and the average family size is 4.02. In the city, the population is spread out with 34.8% under the age of 18, 11.3% from 18 to 24, 26.3% from 25 to 44, 15.8% from 45 to 64, and 11.9% who are 65 years of age or older. The median age is 27 years. For every 100 females, there are 90.9 males. For every 100 females age 18 and over, there are 85.7 males. The median income for a household in the city is $24,333, and the median income for a family is $25,916. Males have a median income of $19,169 versus $16,737 for females. The per capita income for the city is $9,462. 35.5% of the population and 30.8% of families are below the poverty line. Out of the total population, 46.6% of those under the age of 18 and 23.1% of those 65 and older are living below the poverty line. Pharr City Hall is located at 118 S Cage Blvd - Pharr, Texas 78577. The Innovation & Technology department operates its official website (http://pharr-tx.gov), as well as its local government television on Time Warner Cable channel 17.12. All current social media platforms are used to allow for interactive governmental operations. The Pharr–Reynosa International Bridge is operated by the city of Pharr. The Texas Department of Transportation operates the Pharr District Office in Pharr. The United States Postal Service operates the Pharr Post Office in Pharr. Pharr has I-2/U.S. 83 as its major east-west artery. U.S. 281 runs north-south through the city and intersects I-2/U.S. 83 at the center of the city and continues south to the Pharr-Reynosa International Bridge. From I-2/U.S. 83 at the center of the city north to Edinburg (and eventually to George West), U.S. 281 is co-signed with I-69C. The majority of Pharr is served by the Pharr-San Juan-Alamo Independent School District which has five high schools in the city: PSJA North with around 2,700 students and PSJA Southwest Early College High School with approximately 1,750, Thomas Jefferson TSTEM Early College High School, PSJA Sonia M. Sotomayor Early College High School (new to 2016-17 school year) and Buell Central DAEP. Zoned PSJAISD schools include PSJA North and PSJA Southwest. A small fringe portion of the city is a part of the Hidalgo Independent School District. Another small portion is a part of the Valley View Independent School District which has one campus with around 2,000 students. In addition, residents are allowed to apply to magnet schools operated by the South Texas Independent School District. The Pharr Public Library serves Pharr. Zacualpan de Amilpas, Tetela del Volcan, and Ocuituco, Morelos, Mexico. 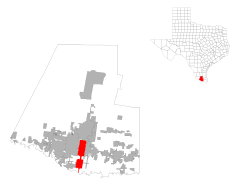 ^ a b "Geographic Identifiers: 2010 Census Summary File 1 (G001): Pharr city, Texas". American Factfinder. U.S. Census Bureau. Retrieved February 21, 2018. ^ Norman Rozeff, Historic river flooding in the valley, 2009 May. ^ "LAS MILPAS, TX." Handbook of Texas. Retrieved on September 27, 2013. ^ "Pharr International Bridge." Pharr International Bridge. ^ "Pharr District Office." Texas Department of Transportation. Retrieved on January 11, 2010. ^ "Post Office Location - PHARR Archived 2010-05-04 at the Wayback Machine." United States Postal Service. Retrieved on May 9, 2010. ^ "PSJA High School Zones." Pharr-San Juan-Alamo Independent School District. 2015. Retrieved on January 3, 2017. ^ "Pharr Library." City of Pharr. Retrieved on May 9, 2010. ^ "Ryan Gabrielson, The Monitor, McAllen, Texas Knight Ridder/Tribune Business News". 2003-7-23. Retrieved on April 17, 2010. ^ "Ciudades mexicanas y sus ciudades hermanas estadounidenses" [Mexican cities and their American sister cities] (in Spanish). Sister Cities International. Retrieved Feb 18, 2019.